Registration is now open for the 32nd edition of the McGill Sports Camp. The camp mandate is to introduce the participants to a variety of activities, develop basic motor skills, and most of all - have fun! 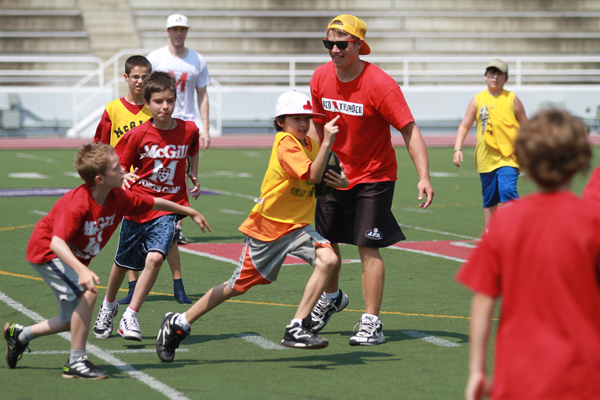 Registration is now open for the 32nd edition of the McGill Sports Camp. The camp mandate is to introduce the participants to a variety of activities, develop basic motor skills, and most of all – have fun! The 2015 edition will take place from Monday, June 29 to Friday, August 21. For more information, please visit the McGill Sports Camp home page or follow the Facebook page. Discounted rates are available for McGill staff. In addition, Athletics & Recreation will be hosting a Basketball and a Soccer Camp during March Break. The four-day camps are scheduled from Monday, March 2 to Thursday, March 5. The sessions are supervised by the coaches and players of the McGill Varsity Basketball and Soccer teams. The focus of each camp is sport specific skill development, off-court training, and nutrition. For more information, please visit the March-Break Camps page.